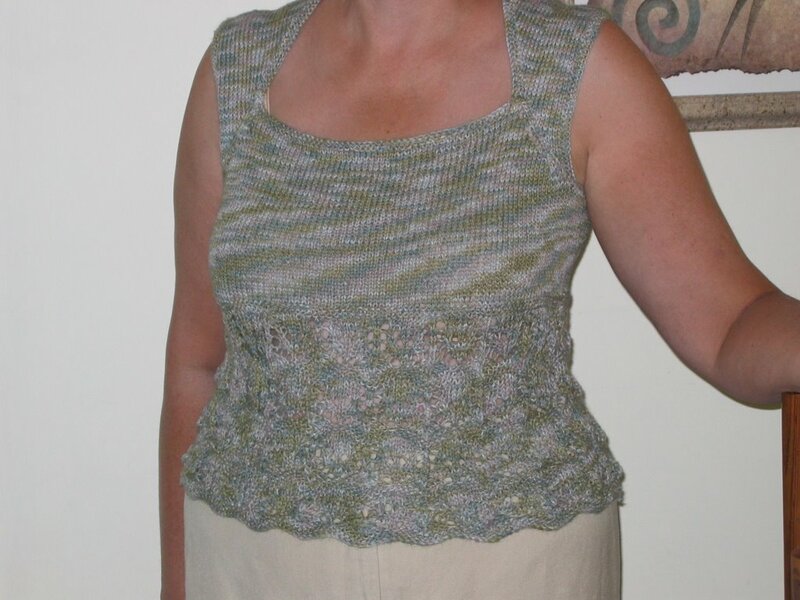 Lotus Blossom Tank KAL: Me too, me too! Just got mine hot off the ironing board, and I am very pleased with it! Mind you I haven't tried washing it yet, just given in a bit of a steam with the iron. Needles: US size 6 and 5 Denise interchangeables. Modifications: None really, except a half inch extra of st st before the armhole shaping. I am glad I took notice of advice here about negative ease. It would have been huge on me if I had gone for the size that I thought should have fit. Thank you everyone on the knitalong for all the helpful hints and encouragement. I will keep popping back to see how everyone is doing. I love how yours turned out! Fits you perfectly. the colors are lovely around the lace portion! i like the variegation! great job. Advice for YO between knit and purl stitches?